Wanna Know How New Parents Can Turn A Few Clicks Into Free Huggies Diapers? Any parents or grandparent knows that diapers can get very expensive. There is nothing worse than spending money only to find out that it does not work for you, your child, or your grandchild. Right now, you can get a FREE sample of Huggies OverNites diapers. Choose from two different diaper sizes, and select whether you would like to receive a diaper sample for a little boy or a little girl. After you have submitted your completed sample request form, you can expect to receive your diaper sample in the mail within 4 to 6 weeks time! Hurry, this freebie offer will not last for very long! Parents Are Going Crazy For This Diaper FREEBIE Offer! Parents are going wild over this diaper freebies offer from Cuties! For a limited time, you can request a FREE diaper sample in the size of your choice. Choose from newborn sizes up to size 6. Once you have selected your size choice and entered your mailing information, you should receive your FREE diaper sample in the mail within several weeks. If you want to take advantage of this freebie offer, do NOT delay. This is a hot offer that will disappear quickly. Once supplies run out, the sample offer will disappear. What are you waiting for?? 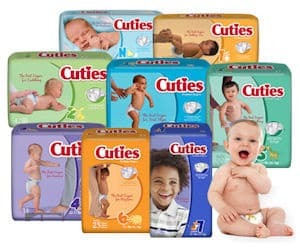 Get your FREE Cuties diaper sample! Moms Who Haven’t Taken Advantage Of This Enfamil Offer Are Missing Out Big Time! Join today and get up to $325 in FREE gifts including coupons, formula samples, Belly Badges™, and more. This offer is intended for U.S. residents only. INCREDIBLE! Get Your FREE Car Seat ID Tag From My Precious Kid! Get Your FREE Car Seat ID Tag From My Precious Kid! Hey parents, we all know how important car seat safety is for our little ones. While you may commonly think about car seat safety in regards to securely buckling your child in, have you thought about the importance of a car seat ID tag? This is not typically something parents think of, but My Precious Kid wants you to have a FREE car seat tag for your child. The tag can be used to provide essential information to first responders in the event that an emergency occurs. The ID comes with a self laminating seal. You can include contact information for relatives, allergy or medical information about your child, and more. In order to get your FREE car seat identification tag, email the company directly at orders@mypreciouskid.com Be sure to make the subject line: FreeGiftNewBaby In your email, include your name, mailing address, how you heard about this freebie offer, and the date your baby was born or adopted, or your baby’s due date. Please note, in order to get this FREE car seat ID tag from My Precious Kid, you must have had or adopted your child on or after August 1, 2013. Be sure to take advantage of this great freebie offer while you still can! Add 100 Points To Your Account with Pampers Rewards Codes! If you have a Pampers Rewards Gifts to Grow account, you will definitely want to check out this offer for Pampers rewards codes! Right now, you can add 100 points (yes, you ready that correctly!) to your Pampers Rewards account. To claim your 100 rewards points, all you have to do is follow the link. Then, log into your account and your points will be added. If you do not already have a Pampers Rewards account, now is a good time to sign up! Even if you are just creating your rewards account now, you can still claim those 100 points. Pampers Gifts to Grow Rewards can be accumulated by entering rewards codes found on Pampers products (diapers, wipes, etc. ) or via Pampers code offers found on the internet (such as this rewards code offer). As you accumulate points, you can redeem them and claim prizes and other special deals. Be sure to check around frequently as new code offers pop of fairly often. However, they expire pretty quickly so add them as soon as you find them! When you join Pampers rewards, you will also gain access to helpful info, tips, and so much more. You will be glad you sign up for your FREE rewards account! 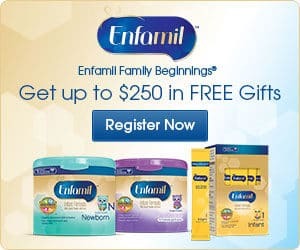 Sign Up With Enfamil Family Beginnings for Freebies, Coupons, And More! If you have a baby or grandchild, you know how expensive baby products and supplies are. When babies are firstborn, it can be expensive to determine what products they can and cannot tolerate. You can waste a lot of money trying out baby products! That is why freebie offers like this one from Enfamil Family Beginnings are so great. You get samples and deals at no cost. That means, no money wasted on products that do not work for you and your baby. 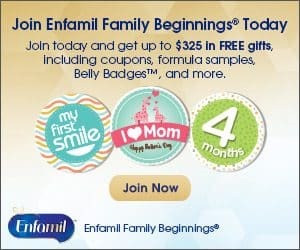 If you sign up with Enfamil Family Beginnings, you will receive up to $325 in FREE samples, gifts, and more. There are so many great freebies for families that have newborns and infants. To sign up, you must first create a profile on the Enfamil website. Once you have signed up, you will begin to receive money-saving coupons and discounts, tips and advice, parenting magazines and articles written by experts, FREE gifts, special offers, and much more. The best part about signing up with Enfamil is that it is completely FREE to do so. So, you sign up and just for joining you get showered with freebies! What are you waiting for?? Sign up to begin receiving samples and gifts for you and your baby! Sign Up To Get FREE Baby Samples by Mail from Whole Mom! 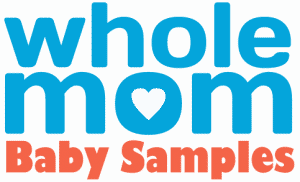 You can sign up with Whole Mom to receive FREE baby samples by mail! By signing up, you should receive a variety of awesome baby freebies to try out on your little one. To register, just complete a brief form. Each month, you should find new baby samples in your mailbox! Whole Mom Is Offering FREE Baby Samples By Mail! Whole Mom is currently offering FREE baby samples by mail! If you like baby freebies, this is definitely a great deal for you! To get your samples for babies, just complete the brief registration form. Once your form has been submitted, you should begin to receive your freebies in the mail within several weeks. 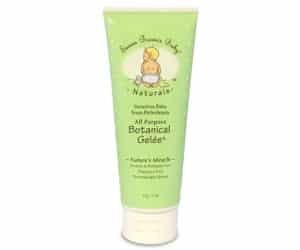 Baby Freebies Baby Naturals Shampoo Sample! Who likes baby freebies?? If you do, check out this FREE sample offer from Susan Brown’s Baby Naturals. You can request FREE baby shampoo by sending an email to info@susanbrownsbaby.com and providing your name and mailing address. Be sure to mention in your email that you would like to receive a FREE sample. Who likes baby freebies? 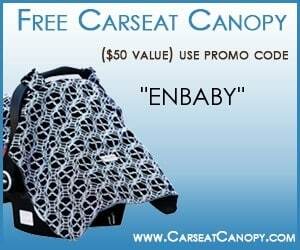 If you do, check out this offer from Carseat Canopy.com! You can get a FREE carseat canopy when you enter the discount code ‘ENBABY’ at check out. The carseat covers are valued at $49.95! All you have to do is pay the shipping and handling fees. You select the size and print you want for your canopy. They have some adorable and fashionable prints to choose from!